On Sunday nights, my family has our weekly “treat” or dessert. We are trying to get out of the habit of eating sweets too often. Although some weeks we have more than just the Sunday dessert, this is a goal of ours to try to make sweets more special and less often. We’ve been trying to lower our overall sugar intake for our family and thus Sunday dessert was born. This past week, my husband and I chose my Apple Crisp Parfait but my kids wanted cookies. I had some cake mix so I figured I’d just make some cake mix cookies since they are so ridiculously quick and easy and then…. dun dun dun…. my kiddos could not agree on a flavor to save their lives. 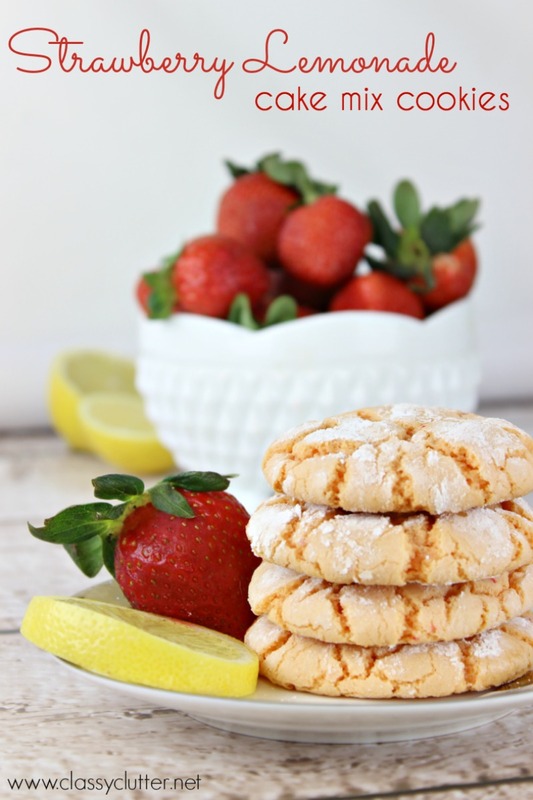 C wanted Lemon Cookies and P wanted Strawberry. 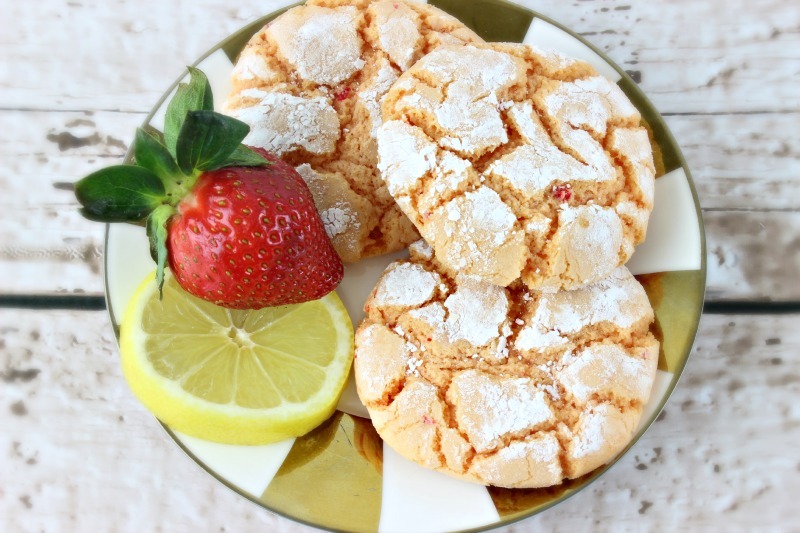 I giggled and asked “why don’t I mix them and make Strawberry Lemonade Cookies!” You guys… Best. Idea. Ever. 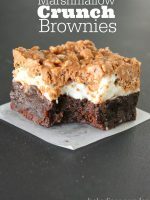 They were so quick and easy to make and taste amazing. The kids LOVED them! 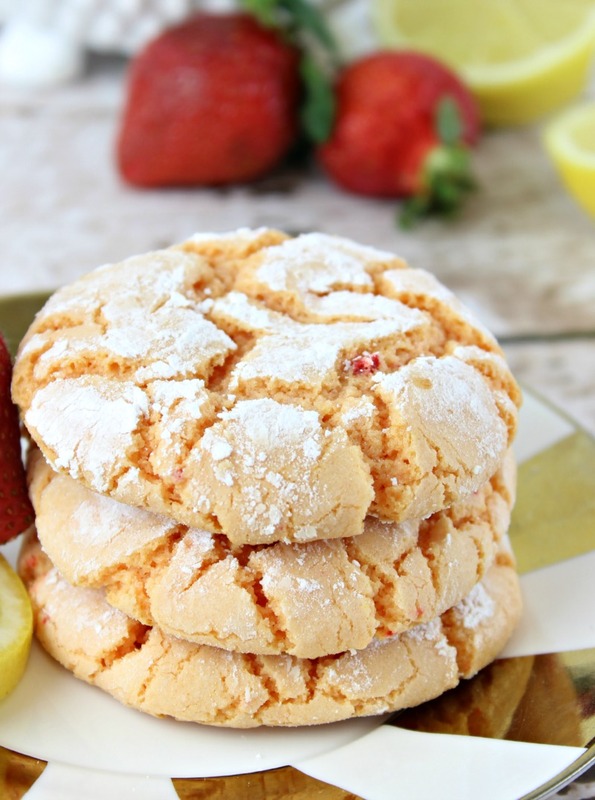 Try making these delicious Strawberry Lemonade Cookies you wont regret it! Preheat oven to 375 degrees. 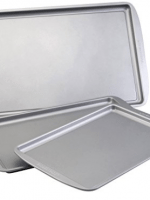 Line cookie sheet with parchment paper or non-stick spray. 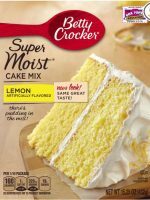 Mix all ingredients except the powdered sugar into a mixing bowl and mix thoroughly. Dough will be sticky. Roll dough into 1″ balls (a little smaller than a golf ball) and roll the dough ball in the powdered sugar. I put my powdered sugar in a cereal bowl and rolled it in there so it was less messy. Place rolled dough balls on cookie sheet and bake for 9-10 minutes. Allow to cool for about 3-5 minutes and transfer to cooling rack. Hello Ladies and congrats on your great blog. Since you want to lower your intake of sugar, I’d like to suggest you to bake your deserts from scratch. 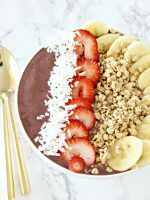 Those ready-made mixes are loaded with sugar and syrup (as well as other nasty ingredients like transfat). 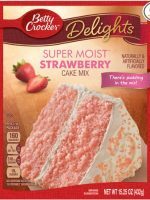 Whilst the World Health Organization recommends adults to consume 25g of sugar per day, read the label on some of those famous strawberry mix brands: 20g sugar per serving, 12 servings per box, 2 boxes in the recipe = 480 g of sugar! A great cookie recipe would contain 25g of sugar per 200g flour/ 1 egg. I can only recommend you watched “Fed Up, The Movie”. Big aha moment for me. I am not a health/ food freak but just like you, would like to make sure my 3 kids eat what is good for them. Love reading you, keep up the creativity! Yes, we actually watched that too! I usually do but my little guys wanted something quick and we only do one dessert a week which is a significant cut back for us. Thanks for the info! 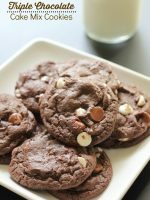 I love the idea of using a cake mix for cookies. It just makes it a little bit easier. Can’t wait to give this recipe a shot. Just pinned it too. Quick and easy treats are my favorite! 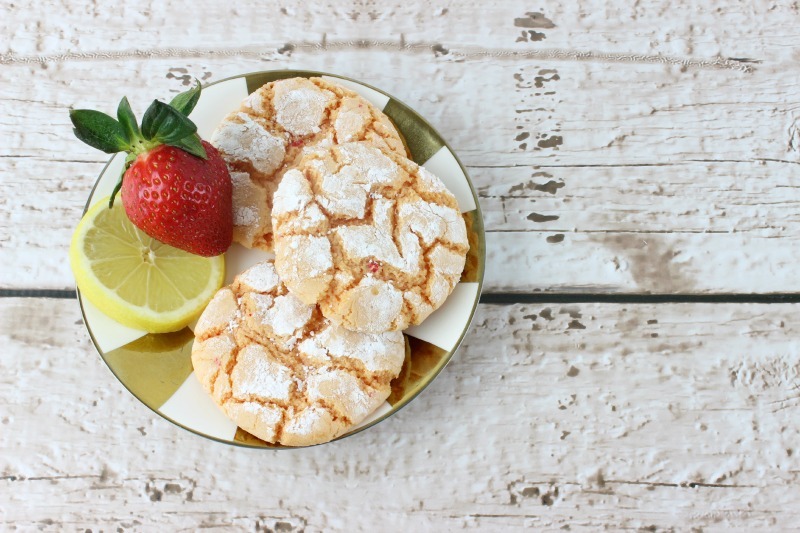 I can’t wait to try these easy cookies and to surprise my cute family with them! Yum Yum! Thanks for sharing. PINNED! Love your recipe and all the photos! Make me craving !